A reference type can be categorized in two types : Mutable and Immutable. The plain english meaning is “Can Change” and “Cannot Change” respectively and which is same here as well. It means an Immutable type object cannot be changed after it’s creation/initialization and if one tries to change, a new copy gets created (if allowed) and returned. In other words, it is a reference type but having value type semantics. 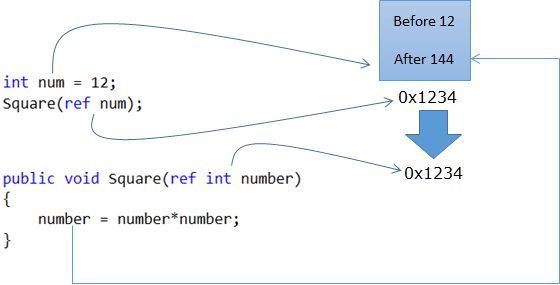 String is one of the most used immutable types and it is provided by the .NET framework. 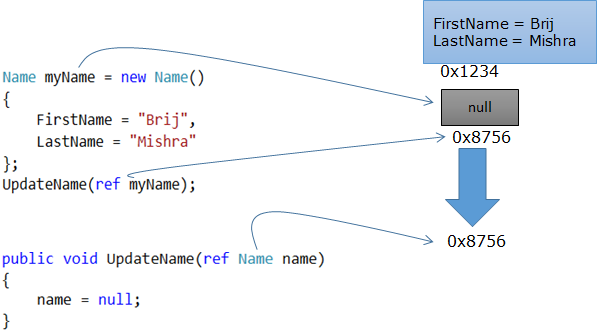 So in this example the output will be Brij Mishra as the same object got changed. This class can also be modified as where we just provide the getter and the values then can be modified either at constructor or any other method inside the same class. Now once we create an instance of this class, it cannot be updated as all the properties are readonly. Even, we cannot update in another new method in the same class as in the previous example. We can use the Const instead of readonly but in that case, we will loose the ability to assign the value while object creation, instead we will have to provide the value at class definition. One more drawback, as const variable initialized at Class level itself, also called compile time constant so it would be same for all the instances of that type. Now we wont be able to add or remove items from list. Still we have here one gap and using we can update any existing address object as Address is not a immutable type. To make it immutable we will require to make all the properties readonly or const. So to make an object immuatble, all the internal type used, should also be immutable and all the collection should be readonly. Here if we try to update the properties other than the constructor, it will throw an error stating that it is readonly. Hope you all have enjoyed the post. Today, I am going to discuss about one of the rarely used but very useful keywords of C# that are called checked and unchecked context. I learnt this few days back. These keywords can be used at certain scenarios and can save you from hazardous situations. This would be more useful when you are playing with lots of data and doing lots of operations over it. It would be -384901888. But how? Because if you check the max value of int. It is 2147483647. Now you can see that the result of multiplication is higher than this max value. So you can think that the value displayed is min value of int. Which is certainly not desirable. And even you would not get any overflow exception. So be cautious, while selecting the data types of variable whether it is a normal or temporary variable. Project->Properties->build tab-> advanced button. So you’ll get the following screen. 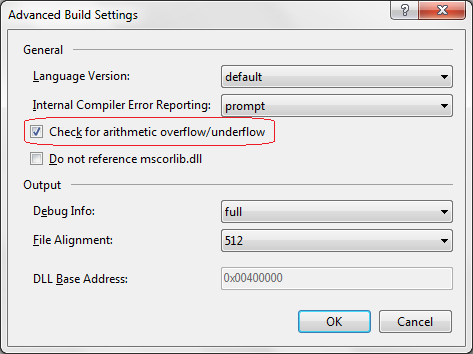 Here you can check the checkbox for arithmetic overflow/underflow and now if you run the code, you will get the OverflowException. But this got enabled at assembly level and if you want to to have at some code snippet level then first uncheck the above marked checkbox and second you need to use the checked and unchecked keyword to have this feature. So checked and unchecked keywords are provided for these scenarios. If you want to get exception if some values overflows or underflows. So if you run the above you’ll get the overflow exception again. What actually checked does, whenever a value is assigned to primitive variable, it the checks with the variable’s max value if the value is greater/lower than the max/min value, it throws overflow/underflow exception. One need to be cautious while writing checked/unchecked keyword. This code would not throw any exception. If you have enabled overflow exception check at assembly level but don’t want it at certain situations then you can use unchecked keyword. In any case, you cannot rely on user input whether you have some validation or not. So it’s always recommended that you have this check and code for handling the overflow exception. Even if you are getting from some third party services etc, then also I would recommend this check. You cannot rely on the following code, generally it does not throw overflow/underflow exception. I mean, one should write code statements in checked block. If you are calling any method from the checked/unchecked block, you cannot sure that it work as desired. These checked/unchecked context works on CLR primitive types only. System.Decimal is c# primitive type but not CLR. So checked/unchecked context has no effect on this. I hope you all have enjoyed this feature if didn’t learn it earlier. Who already aware of this feature, please share some more points that can be added here. The debate about Singleton vs Static is quite old and it is still continuing and there are lots of confusion around this as well. In this post, I am trying to explain these two concepts, key differences and its usages.In this post I will not focus on the basics of Static and Singleton and how to write that. If you are new to these keywords, I will advise you to learn about these first to get more benefited. Static classes cannot be instantiated so it restricts us in many ways like it cannot implement Interfaces, inherit any class etc. Any other scenarios where this keyword is required, it cannot be used like indexer etc. Also it cannot be used as method parameter, local variable etc for the same reason. Static classes can have only static members – constructor, fields, methods, properties, events. One cannot control when static constructors are called. It’s always earlier than first access of the class. So no parameters can be passed as well. As name suggests it allows to have only one instance of a class. The constructor of this class are marked as private so that accidentally one cannot create multiple instances and provides a static function/property which first create one instance and returns the same each time. As singleton is a normal class, it allows us to leverage all that features of object oriented programming concepts. There is much confusion around memory management of static class and Singleton class. In simple words, any class whether it is itself static or any member if marked as static then it would not be collected by Garbage Collector. Static variables/classes are not stored in normal Heap and there is a separate space in memory to store static resources which holds the static classes and variables.This space is beyond the scope of GC and memory get release only when corresponding process/AppDomain unloads. Because singleton holds a static reference which cannot be collected by GC so the instance cannot be collected and both (Static and Singleton) gets destroyed with the AppDomain/Process. As both of the static and singleton instances are have just one copy in memory throughout the whole application, both used for holding global state in an application. Both are initialized lazily, it means for static classes it is initialized only when accessed first time and for Singleton, it gets created only when it is accessed first time. Very first difference is that Static is a language feature and Singleton is a architectural pattern so both belongs to difference arena altogether. Now a days everybody is behind using Dependency Injection and Static does not fit there because it is interface driven. Unit Testing is another topic where you can find some way to create a mock for singleton instances but testing static is a nightmare. Being singleton is a just another class, it enable you to use Object oriented concepts. Singleton approach is much more flexible as we can see that from the differences itself. We can use interface with it and implement it in a class and use in our application. If some requirement changes and later we require to change the logic then we can just remove the older implementation and replace with new one without hiccups as long as the interface is same.. Also testing is another key benefit. Static classes is mainly recommended for having grouping of a bunch of utility methods that can be called independently but again testing could be a problem and benefits of OOP is gone. So most of the time static should be avoided. Having said that using global variable (like static class or singleton) makes a strong coupling between the global data and all the places where it is used. In this post, I am going to talk about ref keyword in C#. You all must be knowing the basic use of this keyword. But for them who are new to this keyword or C#, will explain the basics. ref keyword is used to pass the parameter by reference. It means the parameter references the same memory location as the original variable. So when the variable is updated in the called method, then initial variable is not updated but the copy variable gets updated. So here after execution of UpdateName both variable name and myName points to null and now the object is available in memory but not accessible from any variable. 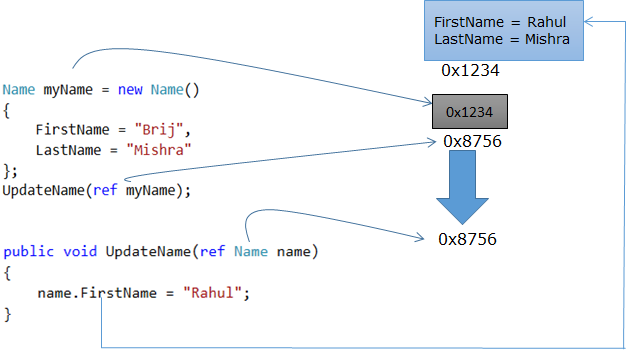 So here variable name points to null but myName still points to that object and object is accessible. 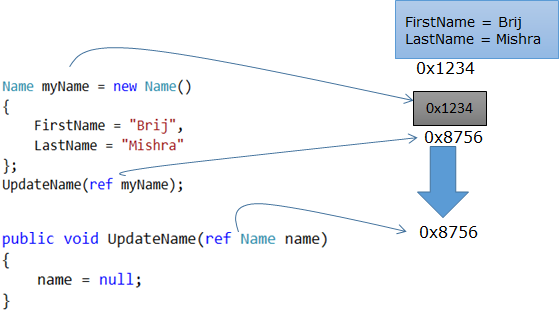 So it means as long as we update the object by updating it’s property method etc.,it is same in both case but when we play with the variable name then it makes a difference as we have seen in the above example. So next time when someone asks that difference by passing the a reference using ref keyword or without ref keyword then you can explain it.